I woke up at an unfeasibly early time to wave Ginge off to work and try not to waste too much time before I set off for my run. Placing my trust in the Met Office, I had shuffled yesterday’s planned long run to today in the hope that the weather would be more accommodating. The route I chose is one of those sneaky loops where you reach half way (and could still turn it into an out and back), but you carry on and then it feels like you’re practically home, even though there’s still three miles to go. It’s also a good one for tacking bits on at the end, which is how I ended up thinking “I’ll just go this way for half a mile and then turn back” and then “Well I could just do another half a mile and then turn back” and when I did run back, I ran past the house at 9.25 miles, and it seemed rude not to round up to 10. On my long runs, I like to listen to spoken word stuff and today was an odd mix of the Infinite Monkey Cage Christmas special (where I learned about superstitious pigeons and pretended to understand stuff about quantum physics) and the dulcet tones of David Tennant reading The Pied Piper of Hamlyn on the BBC Play of the Week podcast. I can neither confirm nor deny that Mr Tennant helped motivate me to run further than I intended. This is mostly because I will get into trouble with Ginge. I passed a grand total of 4 runners this morning (5 if you count the chap I passed twice) with mixed success on the smiling and saying hello front (much more success from dog walkers, horse riders and the man who must have thought that I was really cheerful but I was just chuckling at something on the Monkey Cage). One lady stared straight ahead without a flicker of acknowledgement despite (or perhaps because of) me grinning and staring intently at her. The next two people I passed, I thought were two quite short ladies in matching Christmas hi-vis jackets, but as I got nearer I realised that they were two fairly young sisters who did a sort of embarrassed “we’re not running really” kind of run as they passed me. Unfortunately, I had already set my face to “beam” and they looked slightly terrified at the weird red-faced woman barking “Morning!” at them. Ah well. Apart from the daily opportunity to scare people by smiling, the thing that I love about the Athons is the chance to explore other blogs, meet new people and be part of the big fuzzy ball of encouragement that is generator. Unfortunately, now that there are over 200 entrants, it’s pretty much impossible to visit every blog, every day so what I’ve decided to do is pick a random blog every day and have a read of that one. I’m using a random number thingy and the Janathon participant list, so by the end of the month I will have been to at least 31 new blogs. I had a bit of a shaky start with it last night as the numbers it came up with corresponded to blogs that either hadn’t been written or that I already read, but eventually it led me to Carrie at Baby Weight Go. I have started doing a cheery hand wave when I pass, sorry when people pass me, but I think they believe it’s a call for medical assistance. Note: when I say pass, they are always running in the opposite direction. I don’t think I’ve ever overtaken anyone outside a race. Yay! This has made my day! Big grin! What a great formula for seeing other blogs! I often forget to go to the original participants list, to visit others unknown to me… good idea 🙂 …and what lovely long runs you have! I like your random number generator idea. Why not take it a step further and let it choose the number of miles you run each day? Ooh I really like the Ball-O-Rama! I also like to do runs where I can just a a loop or two on at the end. Mmmm. Lindor, can you please suggest a challenge where I eat all the lindor balls on your blog? 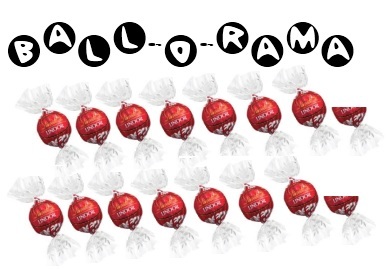 Anyway HOORAY FOR THE BALL O RAMA! Bloody hell, ten miles, get you! Great run and great blog! So nice to come across another ‘smiley’ runner – there don’t seem to be many of us out there. 10 miles – brilliant!! I can’t believe you only ran your 1st half marathon what? 4 months ago? A marathon this year then? I’m with you – I like reading the blogs! !